Tonight on The Walking Dead, I’m not crying, you’re crying! Okay, let’s admit it, we’re all crying as we say good-bye to the one and only Rick Grimes…for now. 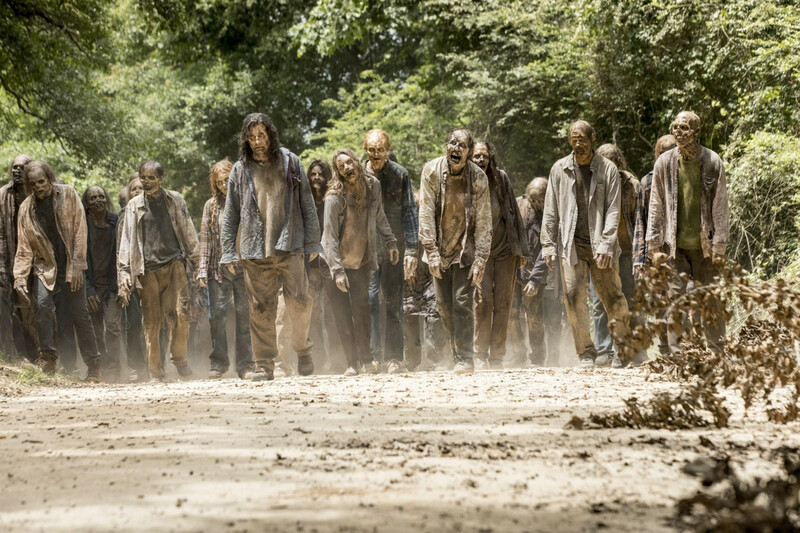 The plot: Picking up right where we left off, Rick Grimes has been fatally wounded by falling on rebar while surrounded by not one but two herds of walkers. 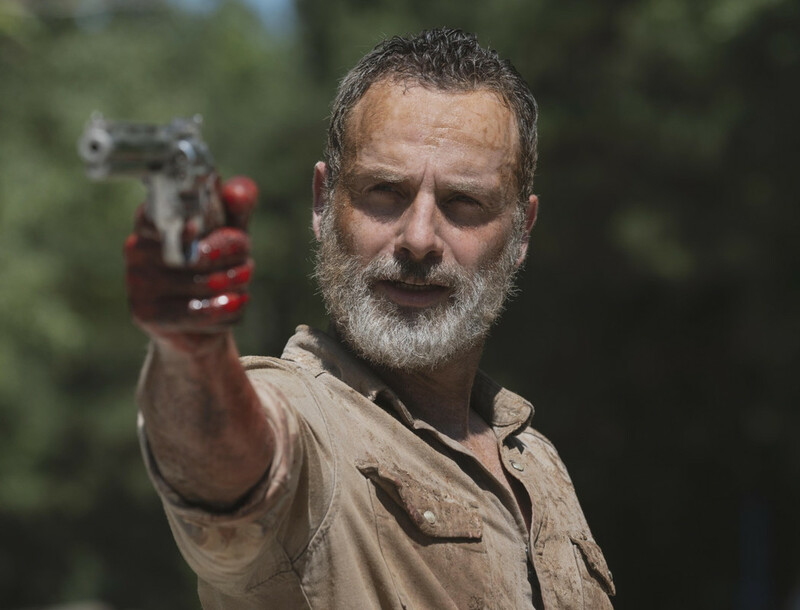 While Rick struggles to escape, attempt to bind his wounds, and eventually leading the herd to the bridge for the safety of his loved ones, we’re treated to a walk down memory lane and into the psyche of Rick Grimes. 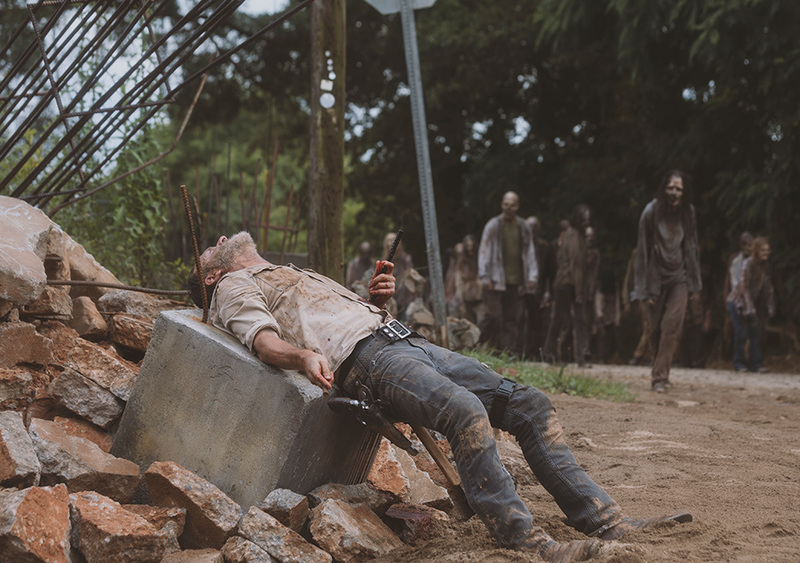 With visits from fallen friends Shane, Hershel, and Sasha, Rick keeps talking about finding his family, while they keep telling him to wake up just in time to not die. Eventually, Rick realizes that the people here, the friends he’s met and gathered over the years and built a new world with, they are his family–and in order to save them and their homes, he blows up the bridge even though it will mean his own life. However, Anne has meanwhile confirmed the call to her helicopter friend to pick her up, at first claiming she still has “an A”, but at the last minute, she spies a not-dead-yet Rick washed up nearby. She radios that she has “a B”, a friend who needs help, and can they save him? It turns out they can! We last see Rick not dead at all but on the copter and hooked up to some modern medical machinery with Anne telling him he’ll be okay. Before all this wraps up, Maggie makes her visit to Negan with the full intent to kill him. But when he breaks down and begs her to kill him because he can’t live like this, she finally has what she needed after all. But that’s not all! 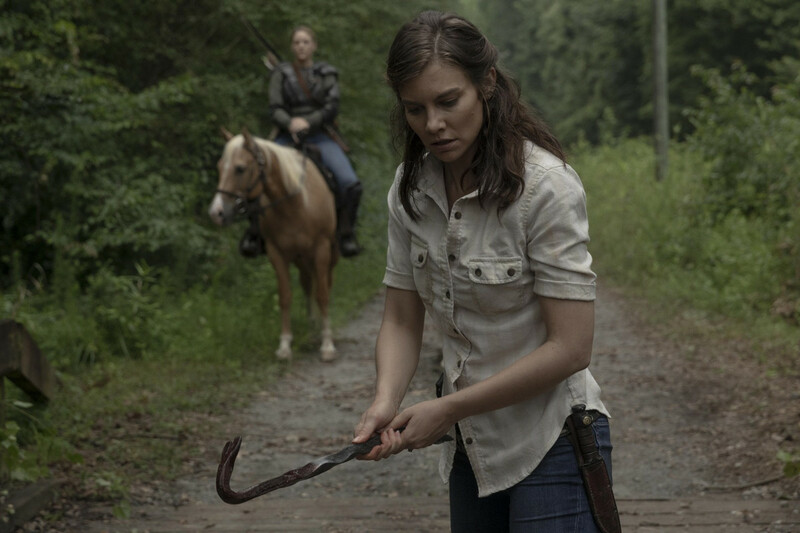 We then jump forward 6 years and meet Judith Grimes, wearing her dad’s gun and hat, and looking about as old as her brother was at the beginning of the show, but as confident as he was when he left. There’s a lot to Rick’s journey, so before diving into that, let’s talk about Maggie. Tonight, after much controversy and build-up, Maggie finally confronts Negan with every intention of killing him and killing him as viciously as he killed Glenn. I’m glad it never came to blows between her and anyone else. I like how it played out with her and Michonne, that even though Michonne did not like this course of action, nor could she bring herself to stop her friend, because she didn’t entirely disagree with her, either. But in the end, Maggie didn’t need to kill Negan at all. It wasn’t revenge. It was, as she said, justice–just not the justice she thought she needed. Not his blood, but the knowledge that the person he’d been, the vicious, murderous man, was dead already. Broken, begging for death, crying that he cannot live like this. I think that it was these words that got to Maggie in particular, because she had just said the same to Michonne, that she could not live like this anymore, even though she’d tried. Seeing Negan as broken as she felt, seeing him wishing to be with his dead wife as badly as she wanted to be with Glenn, this really hit home. It was powerful and humanizing, for both of them, and it gave Maggie her power back. She no longer had to live stuck in the moment of Glenn’s death, no longer cowering in the shadow of this man who made himself into the monster in her life. He’s not a larger-than-life monster anymore; he’s just a man. Okay, onto Rick and his journey! I loved the flashbacks in this episode, the parallels to the pilot, it was wonderfully done. 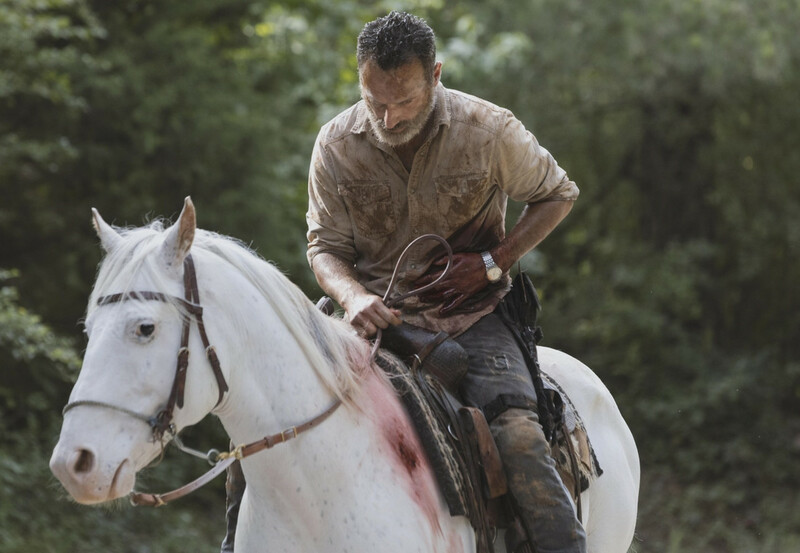 Rick on a horse, alone, bleeding, hurt in the same place where he was once shot, wandering through a dead world looking for his family. I loved seeing Shane, Hershel, and Sasha, hearing their messages for him, telling what he needed to hear. Especially Hershel, given that the actor, Scott Wilson, has since passed away. It was great to see Shane and Rick interact the way they once did–friends, brothers, partners. They even joked about the fact that Judith is Shane’s biological daughter! Since we know that this is all in Rick’s head, the things they all have to say are idealized, I know, but as Rick’s imagined Michonne says (more or less), that doesn’t mean it isn’t real. It’s Rick telling himself things he knows, deep down, in order to keep himself going and readying him to do what he needs to do. Shane’s perhaps more forgiving than he might’ve been in life, but that’s why Shane is the one to tell him he needs to dig deep and push himself, to latch onto and use the fierceness and resolve that we know he has in him. Hershel, naturally, is the one to reassure Rick that Maggie is strong and her son will make her stronger–because Hershel, like Rick, is a father who knew, too, the strength that a child can give a parent. And Sasha, who also sacrificed herself for the greater good, representing the part of him that knows they are all connected, that their story goes on even if they don’t. Then, finally, Michonne reminding him that they don’t die (more prophetic than we all thought! ), and helping him realize that this is his family, the people of these communities, the ones he has known, loved, and built a new community and future with. While in the last episode, Rick refused to destroy the bridge because he thought they needed it, after these visions, he knows that losing the bridge, and losing him, will not destroy the rest of them. The fact that the bridge is stronger than he expected is a nice, final bit of symbolism to attest to that fact, even if it does complicate matters. But then, of course, the first twist! Not only is Rick not dead yet, he’s found by Anne washed up by the river, and she makes an immediate play to save his life! This is kind of shockingly generous of her, and though we don’t know what the price is, it works. We see Rick on the copter, hooked up to some modern medical machines, with Anne telling him he’ll be okay. It was announced later on Talking Dead that we’re going to get some feature-length movies about what comes next for Rick on AMC at some point (along with other TWD expanded universe material), so while these were indeed his final episodes, it would seem we are not done with Rick’s story after all. I haven’t fully processed my feelings on that yet, but regardless, this was an excellent send-off for Rick, a worthy goodbye for the man that this show has been built around. His will be a large and difficult gap to fill, and I expect we will always see signs of how Rick shaped both his family and the world his family continues to live in and how his legacy will live on. 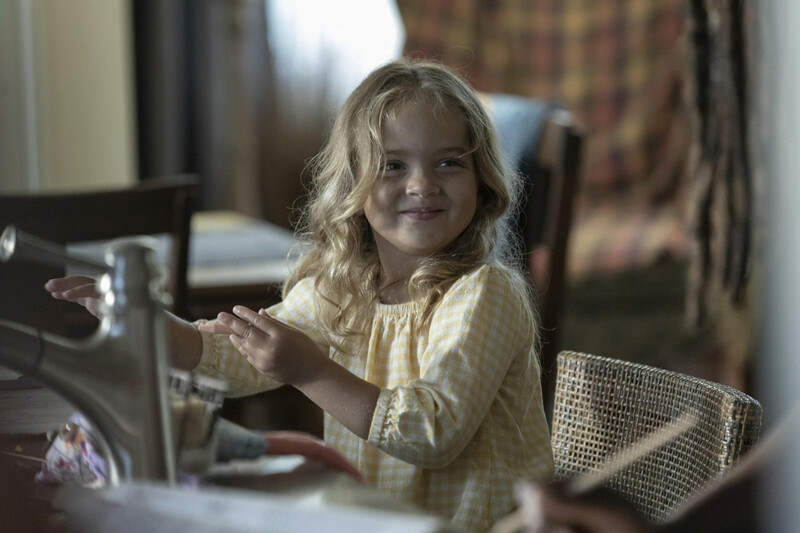 Speaking of which, that brings us to twist number two–a 6-year time jump where we meet the newest face of Judith Grimes! I was not expecting this and I have to say I totally loved the introduction to this child of the apocalypse. As mentioned, she’s about as old as Carl was when we first met him, but with the confidence and skill level he had when he left us. 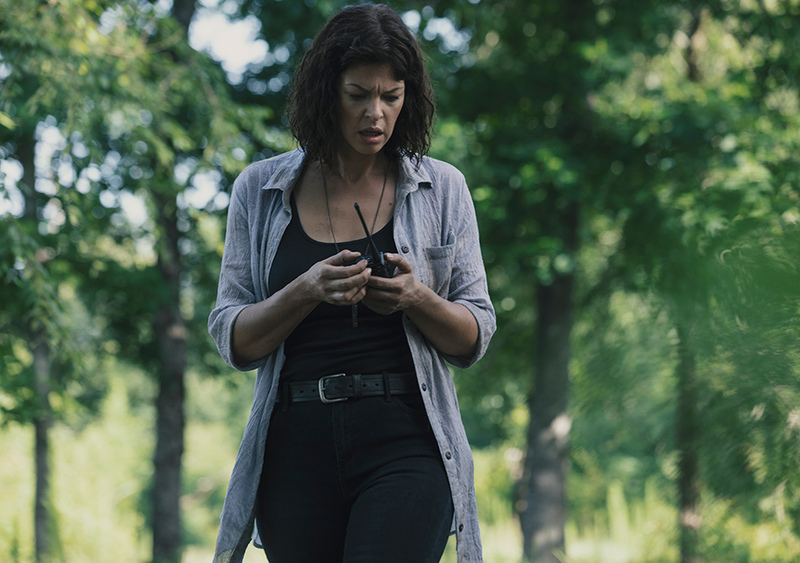 That, combined with the touches of her father’s gun and his/Carl’s hat, and I am ready to see the world and story of Judith Grimes. I also can’t help but think that her character is influenced in part by the success of Clementine from the Tell Tale Games series, and that’s just fine with me, too. We also got glimpses of other ways things have changed in the previews, which I won’t go into, but I am very much intrigued. I think a time jump like this was a good call. With a departure like this one, dwelling on the immediate aftermath where everyone is focused on the hole left behind would really only make the audience do the same, but this way they can jump ahead with some big changes, move beyond that grieving period without losing the connection to Rick overall, and tell new stories in a new era. This was a great send off for Rick Grimes. Narratively, the way it mirrored the first episode was an excellent touch, and the visits from faces we lost long ago on the show to deliver lessons Rick needed was a great way to extend that walk down memory lane. Rick Grimes, a wounded man alone on a mission in a world of the dead. And only Rick could manage to effectively take down two herds by his damn self! But beyond that, the journey Rick takes makes it clear that his legacy will live on in this show, long after he's gone, in his friends, his family, in the larger community. It's because of him that they have this strong start in the new world. And the time jump at the end with the re-introduction of Judith Grimes was a fantastic cap on that, a perfect way to illustrate how true that really is. I'm not sure how I feel about Rick's secret survival, but either way it's his departure from this show, and it did a very good job in delivering a memorable and worthy goodbye. For that matter, Andrew Lincoln has given us a damn good Rick Grimes for 9 years now, and he deserves nothing but praise for that.